Visual Studio Code>Other>LanceDarkly - view LaunchDarkly togglesNew to Visual Studio Code? Get it now. Switching between VS Code, LaunchDarkly web app and other toggle integrations is inconvenient during development. Also, the LaunchDarkly app does not provide a view of toggle states (on|off) for all environments. A VS Code extension to bring LaunchDarkly toggle management closer to your development environment and show all environment toggle states. You will need a LaunchDarkly account. 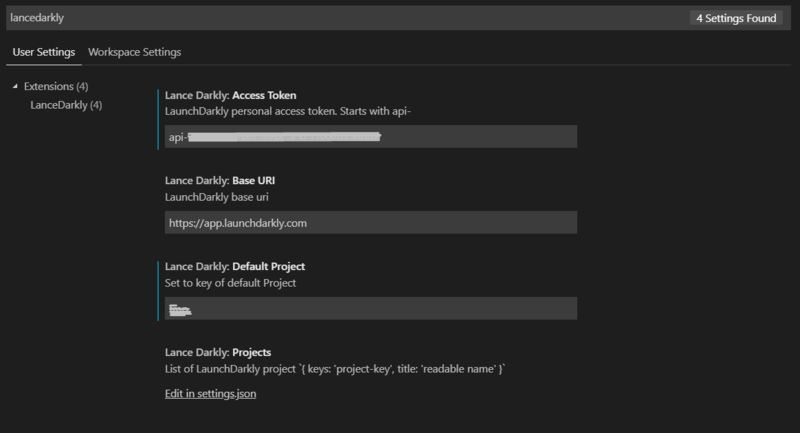 From LaunchDarkly you will need to generate an Access Token. You can find it under: Account Settings -> Access Tokens -> Your access tokens. Set the role to writer to update toggle state (Turn toggles on/off). ctrl+shift+p -> LanceDarkly: List all toggles Opens a new tab listing all toggles. Selecting a toggle shows you details about it. Extend the toggle details view with third party data. Create a folder in your home directory called lancedarkly with a file called plugins.js: %user%/lancedarkly/plugins.js. The plugin function is called when the LanceDarkly: List all toggles command is called. Only change the title and fields properties. Fields must be a 2D array. The detailFields will pass through the toggle key. Maximum of four fields and unlimited rows. First field has LanceDarkly label style applied. const asyncData = await thirdPartyData(); // resolve data before turning API.